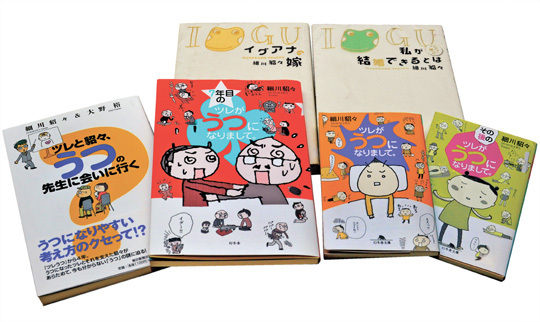 The book covers of Tenten Hosokawa's best-selling manga. 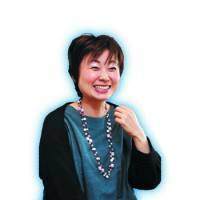 In the last few decades, clinical depression in Japan has emerged from its longstanding obscurity shrouded in shame and guilt to becoming far more openly recognized as a national disease. A 2010 report by the Health, Labor and Welfare Ministry put the number of patients seeking professional care for depression at 704,000 — a more than 300 percent increase from the 207,000 documented in 1996. Nonetheless, the actual number of depression sufferers is believed to be far higher. Reflecting the growing public awareness of the condition, most major bookstores in Japan now devote considerable shelf space to related titles written by people with a wide variety of expertise and experiences — from doctors, nutritionists, sufferers and former patients to their families. As such, comic artist Tenten Hosokawa, 42, was far from unique when she decided to publish a book about her and her husband’s three-year fight with depression. What sets her apart from a plethora of other writers, though, is her ability to depict what many consider grim and even life-threatening situations with wit, humor and, most importantly, warmth. 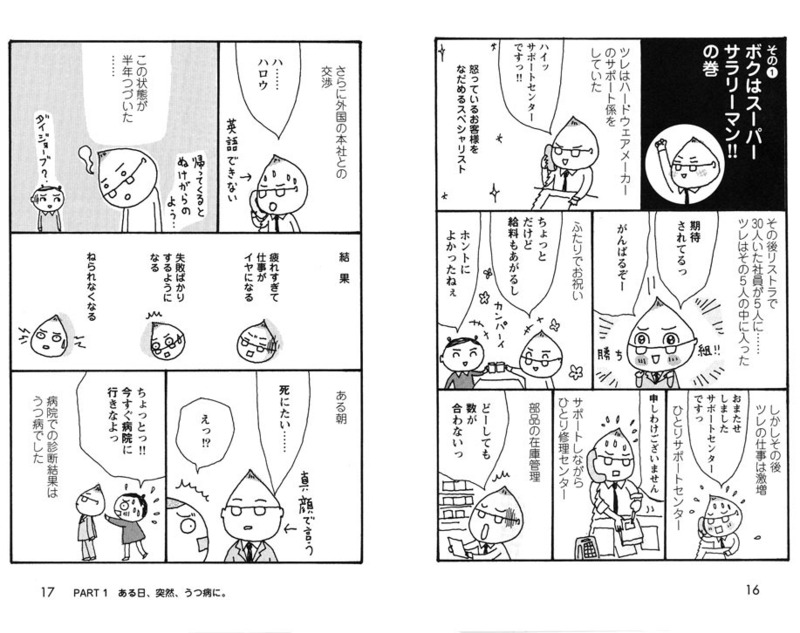 Hosokawa’s first comic book, the essay-style “Tsure ga Utsu ni Narimashite” (“My Partner Has Depression” — best-known in Japan as “Tsure Utsu”) published in March 2006, details how her previously self-confident, over-achieving and fun-loving husband suddenly turned weepy, apathetic and self-accusatory as he came down with the illness. Where once this would have been something for a family to keep to itself, Hosokawa — whose pen name in part derives from the name of mold-breaking Prime Minister Morihiro Hosokawa (1993-94), who was in office shortly before her first work was published in a shōjo manga (girls comic) — says she decided to tell the story because, despite the increasing recognition of the illness in Japan, misunderstandings abound. The author says she also had a dire need to get some work done and earn a living after her husband, Akira, quit his job at a Taiwanese IT company due to his illness. To the couple’s surprise, response to that first book from readers was enormous, and it has sold more than 530,000 copies to date. That success has since spawned two more comic-format essay books, “Sonogo no Tsure Ga Utsu ni Narimashite” (“My Partner Has Depression: the Sequel”) in 2007 and “7-Nen-me no Tsure ga Utsu ni Narimashite” (“My Partner Has Depression: the 7th Year”) in September this year, along with a series of parenting essays co-written by Hosokawa and Tsure, the husband. Meanwhile, the original “Tsure ga Utsu ni Narimashite” book from 2006 was turned into an NHK drama series in 2009, and a full-length feature film, starring Aoi Miyazaki and Masato Sakai in the couple’s roles. The film, with the same title as the book, was released Oct. 8 and is still showing at some cinemas. Hosokawa, who lives with Akira and the couple’s 3-year-old son in Takarazuka, Hyogo Prefecture, but commutes to Tokyo for work about once a month, recently sat down with The Japan Times in the flat in Urayasu, Chiba Prefecture, where the family used to live, and which they have kept on. There, she recalled her own struggles as a young girl out of high school, her first encounter with Akira and how the couple, despite all the hardship, now regard depression as “a summer holiday in life” — an opportunity for a person to stop and think about their life and find their true self. First, please tell me a little about your background. I was born in Gyoda, Saitama Prefecture. I grew up with my mother, father, my younger sister and two dogs — a Maltese terrier and an offspring of that one and a neighbor’s Yorkshire Terrier. Did you go to local schools? Yes, from elementary school through high school. Nothing. I was the so-called “pūtarō” (unemployed) one, doing nothing at home. I was afraid of working, or rather, I didn’t know what I wanted to do and didn’t want to decide and confine my future by getting a full-time job. And I hated studying so much that I was just happy to have graduated from school. How long were you like that? For just about two months. I wanted to find something to do, and my parents wanted me to as well, so I became an arubaito (part-time worker). Looking back, I really didn’t know myself (laugh). I chose a job in the service industry even though I was not good at dealing with people. So I struggled with the job and kept angering my customers and getting angry at them. At a Japanese sweets store in Gyoda — but I soon quit that. My next job was in a factory making computer hardware because I thought assembly-line work would be easier to handle. But I found I couldn’t perform my duties the way others could. My job was to put certain parts on the line, but I couldn’t do it properly so they often ended up having to stop the line. I was told by my boss that I was an obstacle to production. I worked there for about a year, and was completely exhausted. Then I tried an office job, thinking that I could perhaps do well in that environment. But in reality, the relationships there were … (laugh) I don’t know what to say, but some women workers there were so headstrong, and I was easily influenced by other people, so I was a convenient presence for them. I was torn between the people above me in seniority and those who were younger than me, and I got totally exhausted (laugh). I didn’t last a year there. Was it after that that you decided to go to an art school? Yes. As I had struggled with all those jobs, I realized I should do something that I really enjoyed. So I decided to go to an art school. I looked for the cheapest one in Japan and found Setsu Mode Seminar in Shinjuku, central Tokyo, which I could afford to go to with my small savings. I applied, and was surprised to find out that places would be awarded by lottery (laugh). In the end, though, so few people applied that I was admitted without being entered in a lottery. Did you always like drawing? Yes. I was always doodling. What style of drawing was that? Back then I wanted to become a manga artist for girls comic books, so I used to draw in that style. You mean those cute characters with big sparkly eyes? That school, where you studied drawing for two years, was also where you met your husband, right? Did you continue working after you got married? No, I was a full-time housewife for a while after that. I was also applying for contests for new comic artists, and in December 1996 I made my debut in a comic magazine. Was it soon after that that your husband got a full-time job? He got a job just about the time we married, but he quit in 1999, I think, saying he wanted to create music. But we couldn’t survive without him working, and around that time we started keeping an iguana and that cost us a lot of money, so he got a new job in the summer of 1998. Was that the job described in your books, the one at a “foreign-capital IT company”? When you met your husband, what kind of person was he? What did you like about him? When I first met him I used to hate him (laugh). I had generally had very bad experiences with men, and he fitted the type that I disliked most. That’s because, whenever I’d try hard to say things to keep up my appearance in front of other people, he would always detect that and point out my true feelings to them. He would say in front of everyone: “You say this but you actually think that, don’t you?” And I was like: “How dare you say that?” I got upset so I kept ignoring him. He was so blunt and outspoken. Wow. So he wasn’t a typical Japanese man. Not at all. He would bring to school bread that he’d baked at home, telling everybody to help themselves. I really found him strange. But somehow you guys fell in love and got married. How did it happen? Well, after a while I started thinking that, as he sees through me anyway, I don’t have to act in certain ways to make myself look good. I could just be myself. Then I felt relaxed, and started regarding him as someone who was indispensable to me. What does your husband say about you when you met? He said he had been interested in me all along, finding me amusing. He said he felt he found it easy to poke fun at me. So your husband was active and sociable? Yes, and he did things in whatever ways he liked. But then, while he was working at that IT company he became clinically depressed, right? Were conditions at the company really bad? Well, I didn’t think it was that bad, because initially, he excitedly told me that the company cut its workforce (from 30) to five, and that he was one of the lucky five who were chosen to stay! He was more excited than shocked. And he looked happy and was motivated to work hard. But he also looked a bit too excited to me. He started going to live concerts after work and looked as though he was having a fulfilling life, both in and away from work. Then (several months later) he started complaining of various things, like sleeping difficulties. I told him: “You can’t sleep because you a re playing too hard.” But he’d just say: “I can’t sleep, but I can work so well. Lucky me!” And he didn’t look sad. January 2004. He didn’t recover. He still looked ill. Then he said, one morning in mid-January: “I want to die.” That’s when I realized that he needed to go to the doctor. Up until then, what image did you have of clinical depression? I had always thought that depression affected only special people, not ones like Tsure. 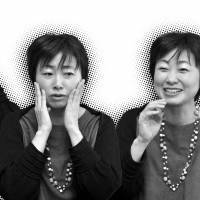 (Laugh) Like some famous writers in Japan who have committed suicide? How did they all respond? They seemed to be surprised, being told such a thing out of the blue, but said they would help me. Your books chronicle the ways you two dealt with depression, including how you tried to change your husband’s diet. Is there anything that, looking back, you regret doing or not doing? 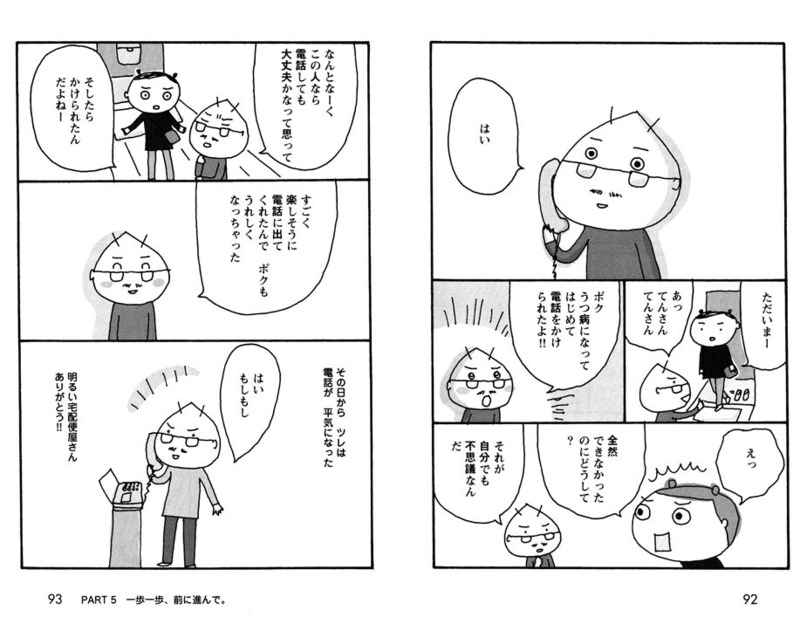 Many people asked me, after I published the first “Tsure Utsu” book, why I had convinced him to leave his job. The common advice for depression sufferers is not to change their environment drastically. So it’s supposed to be better not to leave a job (and take a leave of absence instead). Is that because drastic changes to a person’s environment and routine are believed to add to the stress? Yes. But I was thinking back then, “It’s the work that made him ill, so he should remove the cause of the illness.” I had thought that he would get better just by leaving his job, so I made him quit. In that respect, I could have been a little more prudent. But in the end, the company’s Japan office was disbanded. So in our case it was the right decision. Were you not worried about losing the entire income for the family? Well, the symptoms were so bad that I didn’t even think about the (financial) aspect. His face was getting pale and pasty, and all his hair turned white, and he would look absent-minded. He looked horrible. He told me that, during his daily commute he often had an impulsive desire to smash himself against an oncoming train. Did it get you down, listening to all his complaints and gripes? So you managed to keep a psychological distance from him, and not get sucked into the illness together. Looking back, what was the toughest thing about the ordeal? My toughest time was between the day he was diagnosed as being depressed, and the day he actually left the company. After that, I didn’t feel it was so bad. As long as he stayed at home, I could watch out for him, and it was mentally better for me if he kept on sleeping. I understand that your husband slowly recovered, through ups and downs, and reached a state of complete remission in about three years. That’s really good to know, but there are a lot of people in Japan who don’t follow that kind of track, and some even kill themselves. Others, while continuing their treatment, don’t get well. What makes the difference? Did you really feel that way? So instead of worrying about him getting better, my approach was like, “Let’s think about living happily together the way you are. I’m working, and we can get by financially, so you don’t have to be cured. You can stay the way you are.” He says my words made him feel so much better. That’s really admirable of you. But I’m sure it’s hard for many people to say that. Well, I felt that I shouldn’t have too many hopes, that I shouldn’t be too ambitious. Why did you decide to write a book about the experience? 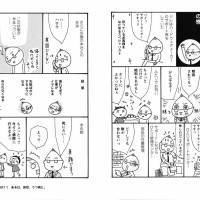 The reason I published “Tsure Utsu” was because, no matter how much I explained the situation to people around me, I couldn’t make them understand it. So I thought I should make a story about us, using my skills as a comic artist, and make them read it. And then people would understand. The book became a best-seller, and has been turned into a TV series and now even a movie. Why do you think it has been such a big hit? Well, it’s not really something to be happy about, actually. Well, (the book’s success) means that we live in a society in which a story about depression gets so much attention. I guess it has become popular because so many people suffer from the illness. Have you received a lot of feedback about the book? Yes, an endless amount (laugh). Really? Has that been from people telling you about their own condition? Well, I got a lot of emails from people who said they wanted to die. … Many of them, sent by depression sufferers and their family members, were very serious. There were also others who criticized my book. With what kind of criticism? I took it in my stride, as I knew that their condition made them feel that way. It’s now five years since your first “Tsure ga Utsu” book was published. Has the feedback changed? Not really … (laugh). So it means that we keep on having new groups of people who fall prey to the illness, going through the same cycle as we did. An important reason to have that book published was your dire need to support the family, right? But did you not hesitate disclosing details of your private life to all and sundry? I didn’t hesitate myself, but Tsure, actually, asked me not to publish the book — three days before it went on the market! Well, it was three days before publication, so I told him I couldn’t. Tsure was begging me, crying. Is that so? I guess, though, that since your books are in comic form, the real life behind those stories must have been harder. Well, yes, probably. But I didn’t actually find it mentally taxing … because I always did what I wanted to do, regardless of his problems. I traveled. I went to antique fairs. And I kept on finding fun things to do for myself. I know you are now often asked to give lectures around the country. How many have you given so far? Well, actually my basic policy is to turn down lecture requests — except ones that I can’t say no to. For instance, I’m giving a lecture tomorrow in Gyoda. I believe that when you first began speaking in public you were just talking about depression, but now you have much more to say about family relationships, lifestyle and parenting. Yes. In our family, I’m the one working and my husband does all the housework and takes care of our son. My son acts like a human being these days (laugh). I was initially worried because I heard, early in parenting, that you have no time to sleep. I was worried that (Tsure’s) depression might recur if he were to be deprived of sleep. But in reality, I got the maternity blues after giving birth, and instead of looking after him I got depressed (laugh). But we’ve somehow managed to ride through the last three years. I’ve tried to be considerate as much as possible, though. I tell him to rest if he is tired. What made you feel blue after you gave birth? I couldn’t breastfeed well, and I got completely obsessed with it. I felt I was worthless as a woman. … It depressed me so much. Then Tsure told me: “There is milk powder! You shouldn’t worry!” And I felt so much better. You have dealt with many themes, not just depression. What other areas are you interested in exploring in the future? In the wake of the earthquake on March 11, and all the other disasters, I would like to create something that can tell people how we can enjoy our daily lives. Like tips on how to find joy despite adversity. I remember reading one of your husband’s recent inerviews in a Japanese newspaper in which he said that now Japan as a whole is suffering from depression. Do you agree with that? Yes. I think that, in the aftermath of the disasters, the ways people are pretending to be okay when they are not are very much like the symptoms of depression that my husband used to have. Interesting. Can you cite some examples? 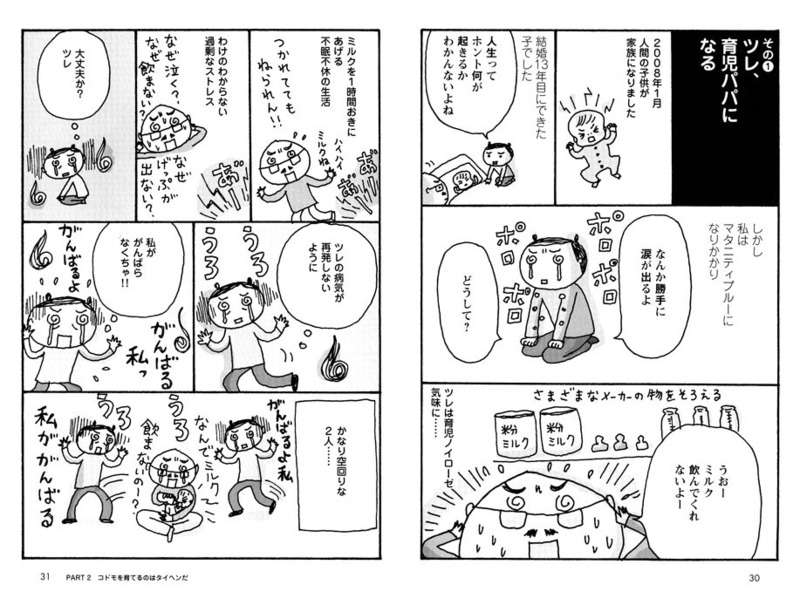 Well, I think we tend to say “Ganbare!” (“Hang in there!”) too much to disaster victims. Because they are told “Ganbare!” so often, they feel under pressure to overwork themselves when they are having such hard times already. It’s just like saying “Ganbare!” to people suffering from depression. I see. Turning to your lives again, what do you think is the secret of a happy marriage? I think we communicate a lot with each other. We are always talking. Some couples ask me, “How can you find so much to talk about? We have no conversation.” In our case, there is so much to talk about — about my work, our son and food, for example. I also talk about Takarazuka Revue, which I love, and he talks about classical music. I guess that helps us stay together. Do you two talk about how your lives could have been had your husband not suffered from depression? Yes. I think I would have been a jobless, struggling manga artist who was negative-minded, always worrying about things, being jealous of others and wishing something good would happen to me. 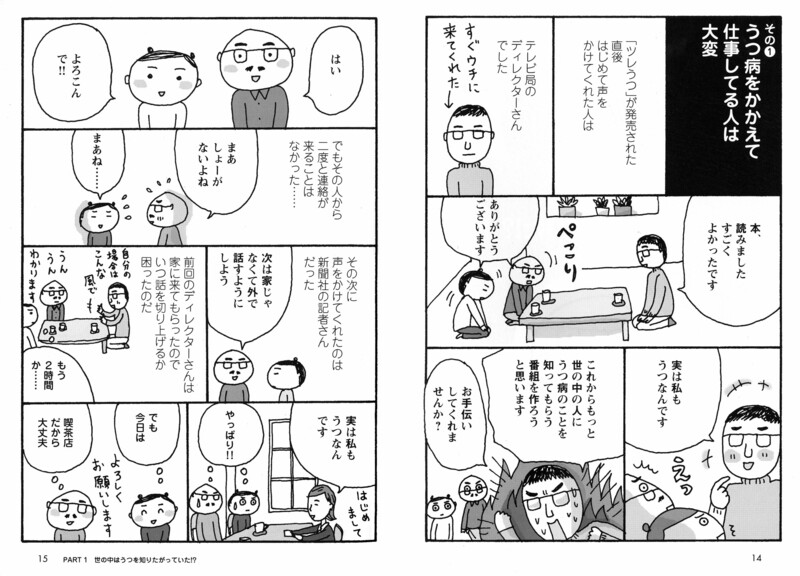 And Tsure would have been the same salaryman, inflexible and fixed-thinking. And we would have never had a child. I think that we got a child because we changed for the better. I think our baby decided to come to us because we are mentally more mature and financially more stable now. How do you think you have matured, having supported a clinically depressed husband? I used to think so negatively before. I’m not like that anymore. Before, I was always unsatisfied about my life. Now I feel so happy about myself. I feel life’s much easier to live. That hasn’t changed (laugh). He still sticks to his rules on which socks to wear. But he has changed in other ways. He used to be the type who would say a man cannot participate in child-rearing. Yes. I think depression has opened his mind to try many new things. Did he struggle with parenting at first? Not at all. He is actually quite sociable. When he made a kōen debyū (taking your child to the park for the first time, which means you make a debut in the local community of parents), he made friends with a lot of the moms! At first he said he was snubbed by them when he said hello to them in the park. But soon, he was liked by the “boss” figure among them, and then everybody else started talking to him. He also has daddy friends. So … would you say you’re happy to have gone through depression? What message do you have for people suffering from depression? I think a lot of people, when they get depressed, become overwhelmed with negative feelings. But the illness also gives you an opportunity to change your life. In that respect, it’s not so negative. Depression gives you a chance to review your life, to look back on how stress has built up — and to change things. So the illness can actually be a positive thing in your life.